Sufficient household food stock for > 4 months due to normal harvest ofpaddy respectively withDecrease of 7% than last year. Availability of the food items in the local markets is sufficient > 1 months due to functioning road access for transportation in most of the VDCs and good purchasing capacity of people. Normal income and good purchasing capacity of people through sale of agricultural product mainly vegetables with worths 119 Million rupees, livestock product (milk, meat, eggs) with worths around 232 Million rupees . Market price of food commodities increased by 7% compared to last year due to the increased cost of fuel. People are adopting normal/traditional livelihood strategies like use of labor wage, remittance,, sale of agricultural and livestock products and small scaled business as well. There is no seasonal migration and acute malnutrition rate is normal. 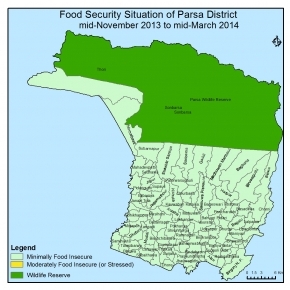 The food security situation is expected to remain same as minimal food insecure in the next cycle. Household food stock will be sufficient for > 3 months and rice could be purchase from markets due to good purchasing capacity. Market food stock will be sufficient for > 2 months due to well functioning of markets due to functional road transportation. Wage employment opportunities will be available from agricultural and big industries as well within the district. Market price of food commodities will be bit improved. Income from remittance, and Sale of seasonal vegetables, livestock product and sugarcane will be continue to support people’s earning. Situation of out-migration, diseases and acute malnutrition will remain normal and security situation is expected to remain calm during the next cycle.